The importance of early socialization and handling of kittens. Thankfully, more people are now aware that puppies need early socialization to have the best shot at being behaviorally healthy, but there are still many that are sketchy on the details of the process. Very few people are aware that kittens also undergo a sensitive period, and that socialization during their early weeks can greatly influence their temperament. Bateson (1979) defined a sensitive period as an age range during which particular events are especially likely to have long-term effects on individual development. A sensitive period may best be defined as the period of time when an animal is best able to attend to and be affected by stimuli, which, when missed, puts him at risk for concerns pertaining to those stimuli. The socialization period is the time when all primary social bonds are formed and constitutes the single most important period during a cat’s life. During this phase, striking behavioral changes occur because of growth and experience. Socialization can occur between a kitten and humans, or between a kitten and his alleged natural enemies, such as dogs and the other unlikely friendships we see so much of on social media. Species identification also occurs during the socialization period. Not only does this permit a cat to recognize other felines, it also teaches him to tolerate, if not fully accept, other cats in social situations. Although sensitive periods have been emphasized as less important in the development of good pet cat behavior compared to the canine equivalent, feline sensitive periods are shorter, more discreet, and (when a kitten misses out on socialization during this period) more frequently implicated in the development of behavioral problems such as play aggression, inappropriate play behavior, and fear aggression. A kitten is more likely to have good social behavior if left with his mother and siblings until he is at least 8 weeks of age (12 weeks is preferred) and in an environment with substantial exposure to friendly people. 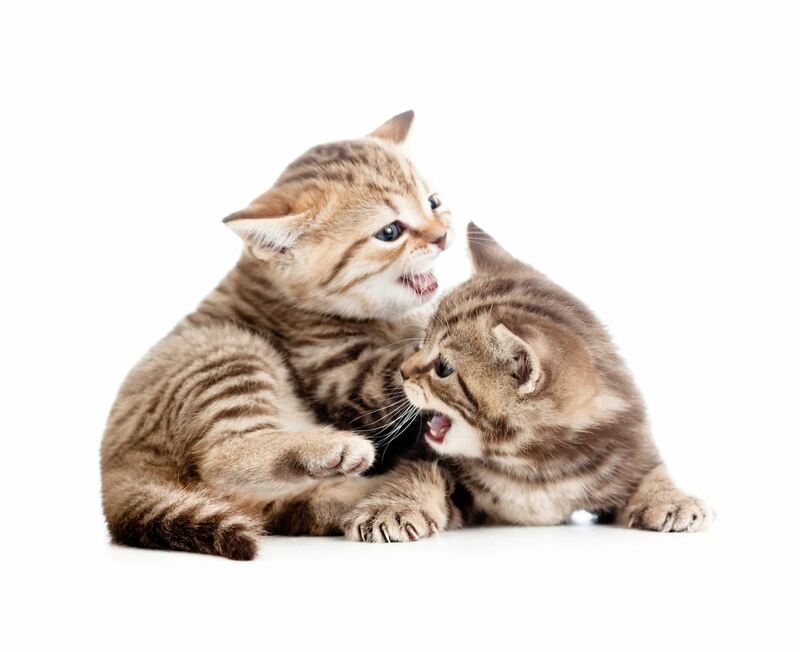 Early development with the queen and siblings teaches kittens to temper play responses; kittens that never learn this may play too aggressively with people. Kittens separated at an earlier age are more likely to be cautious and aggressive. The American Association of Feline Practitioners - American Animal Hospital Association (AAFP-AAHA) Feline Life Stage Guidelines (2010) state that cats are considered kittens from birth to 6 months old. The critical period for kitten socialization usually occurs during the early weeks of a cat’s life starting between 2 to 7 weeks of age (early socialization occurs between 3-8 weeks, late socialization between 9 and 16 weeks). During this period, the cat becomes used to sights, sounds and smells, as well as how to interact appropriately with other cats, people, and other animals. A young kitten has a fearless, exploratory nature during the socialization period. He may startle easily, but will recover quickly. 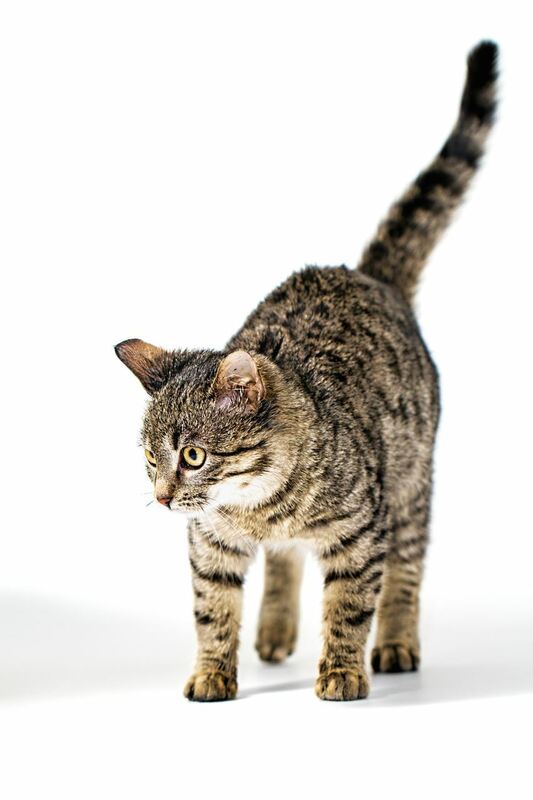 The amount of handling a cat receives, the age at which this occurs, and the number of handlers all affect a kitten’s degree of friendliness towards people later in life. Frequent gentle handling and play with varied people including men, women and supervised children is ideal. It is important to encourage the cat to be comfortable with being held, picked up and touched in different places, such as the ears, paws and belly. You can socialize a kitten very well in as little as 15 minutes of daily handling during the sensitive period. Cats that have been handled by only one person can be held for, on average, twice as long by that person than by any other, but cats with experience of four handlers will stay with any person, including a stranger (the multi-person cat becomes socialized to all humans that behave in broadly the same way). Kittens can do this easily until they reach the end of the socialization period, when they become naturally wired to be more suspicious of things they have not yet experienced, so they can react more cautiously to new things in the environment, such as potential predators. While this period is clearly important to a kitten’s life, a cat’s mind remains receptive to new experiences and lessons beyond kittenhood. In many countries around the world declawing is illegal, as it is considered inhumane.